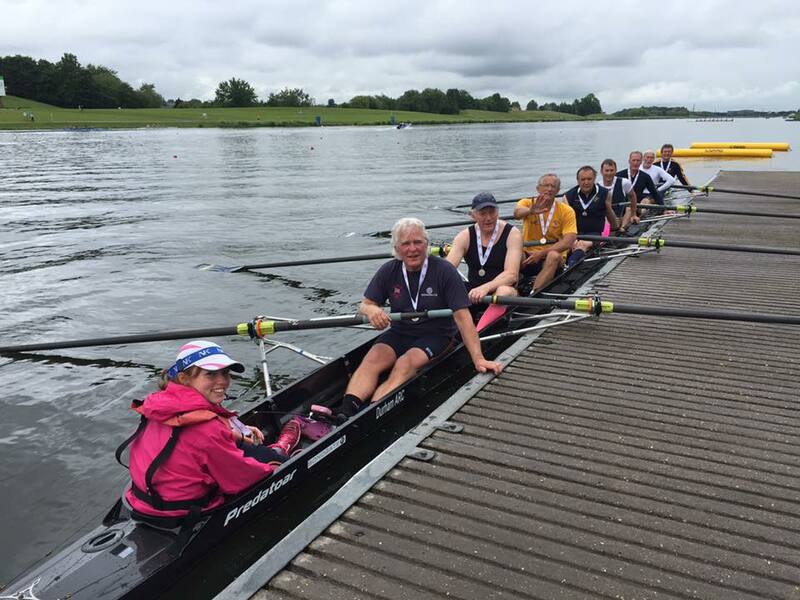 Durham ARC achieved notable success at this year’s British Rowing Masters Championships Regatta last weekend. The Regatta takes place at the National Watersports Centre at Holme Pierrepont in Nottingham and is for competitors in the older age ranges with events categorised according to age bands to ensure fair competition. Around 1500 competitors with ages ranging from 27 to 88, representing over 100 rowing clubs from around the UK, contributed to a record entry this year in an event that continues to gain in popularity. DARC crews picked up 3 gold, 3 silver and 1 bronze medal over the 2 days of competition in categories ranging from C (for ages 45 to 49) to G (ages 65 to 69). Gill Prescott collected a medal of each colour, taking first place in the Women’s Masters E coxless quad (in a composite crew also including Joy Skipper, Eva Rankin and Sarah Payne), 2nd place in the Masters E double sculls (with Eva Rankin), and 3rd place in the Masters D quad (with Helen McMillan, Joy Skipper and Lisa Kallal). 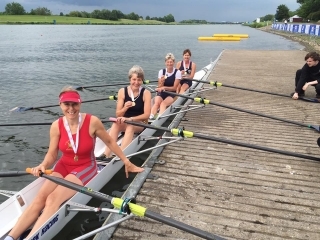 As well as the bronze medal Helen McMillan also won a silver in the Women’s Masters C quad (with Alison Inglis and Hilary Cairns of Berwick ARC and Lisa Kallal of Mortlake, Anglian and Alpha Boat Club). Winning medals in every event they entered is quite an achievement and Helen and Gill were quick to praise their long serving coach Geoff Graham. After celebrating the 50th anniversary of his crew’s win in the Grand Challenge Cup at Durham Regatta the previous day there was a silver medal at the Championships on Sunday for John Appleby, with the men’s Masters F eight of John Appleby, Tim Baker, Martin Judson, David Walker, John Watkinson, Paul Rutter, John Lund, Paul Stanley and cox Emma Hocking. Although the club has a wealth of experience at this level of competition, each year offers opportunities for newcomers to establish themselves. 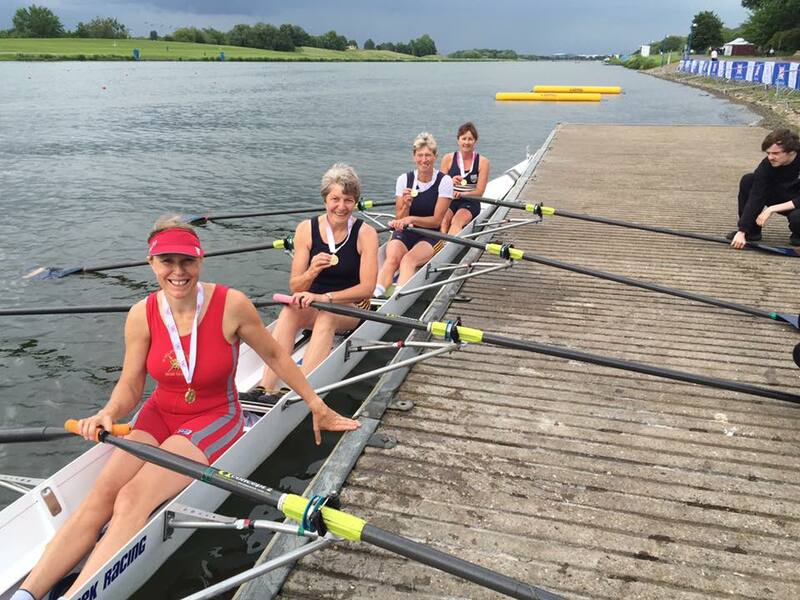 There was outstanding success for Joyce Collett in her first National Championships on the water, winning the IM3 Women’s Masters G single sculls. Joyce only took up rowing 5 years ago after coming through DARC’s Learn to Row course, moving quickly through the ranks to win a gold medal at last year’s British Rowing Indoor Championships. Roger Stainforth, an established and very successful exponent of indoor rowing, was taking part in his first ever competitive race on water at the Championships, having been invited only in recent weeks by Martyn Calkin to form a Masters F double, so it was a great achievement for the pair to come away with gold medals. 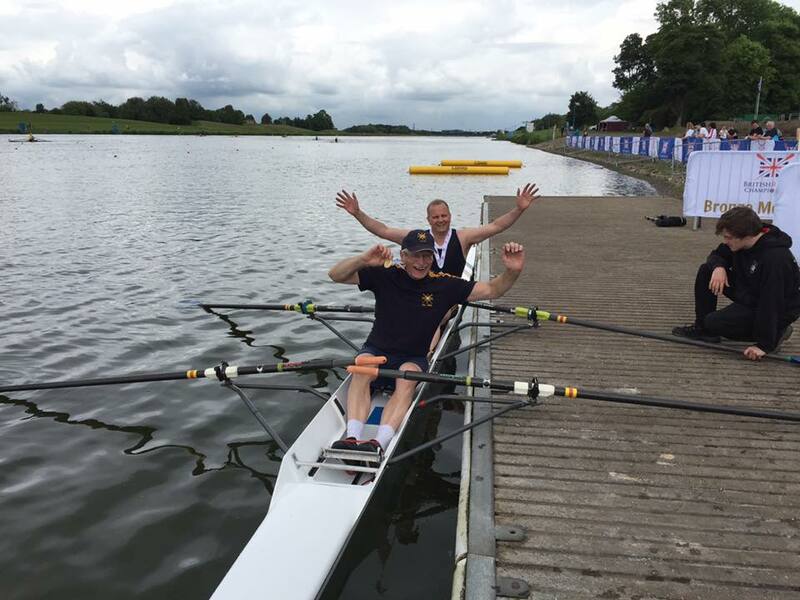 There were many other fine performances from Masters crews in a range of other events where reaching a final at this level is a great achievement. Places for DARC crews are on the Results page.